This is a really interesting post for me as it has been a real discovery and somewhat of an eye opener. 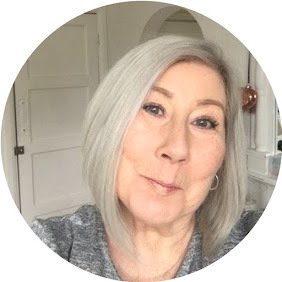 The English Mineral Make Up Company is the brainchild of Mother and Daughter duo Jeanette and Grace Burrows, and was founded with the desire to find a product that could enhance mature skin whilst gentle enough for younger skins. The reason I say it's been a discovery is that I don't like Mineral make up, this opinion was formed a few years ago when mineral make up first hit the market ( I wont mention the brand name ) but you will probably have guessed when I say it was everywhere, and you couldn't go shopping without being accosted by one of the sales girls, well !!! yes one of them captured my daughter making her purse £80.00 lighter and she had a starter pack, yipee ! NOT it was horrible, she hated it so passed it on to me knowing I was eager to try this miracle foundation out, WELL I looked like the corpse bride, I liked nothing it about it, well, maybe the brush, and it was banished to the back of the cupboard, my affair with mineral make up was completely over and anytime I saw an advert for any kind of mineral make up my face screwed up. And when my friend Rebecca at Rougepout Beauty did a post on English Mineral Make Up which you can read here Rougepout.org I still wasn't convinced enough to try it. When I was contacted by the company, I did initially say I didn't think I would be suitable to review for them as I didn't like Mineral make up, they confidently assured me that I would like theirs and here we are. The parcel arrived, and the first thing that totally blew me away was the packaging, I know we don't use the packaging, but there is something really lovely about receiving something beautifully packaged to make you feel special before you even start trying the product, so yes I am by my own admission a packaging trollop. I also love the fact the company is 100% English 100% organic, never tested on animals and is run by a Mother & Daughter. This finely milled powder containing crushed pearls was originally developed as a night time sleep product, which shows how good it is for your skin, the product contains millions of microscopic prisms which reflect light therefore minimising the look of lines and wrinkles, used as a primer it is the ultimate *do good* base, being clear it just sits on the skin like fairy dust doing it's magic, as a primer it works beautifully under the mineral foundation and equally as well over any foundation you choose as a finishing powder, it can also be used as a highlighter, so all in all it provides multi benefits. The Product comes supplied with it's own Kabuki brush which I have to say was probably one of the softest brushes I have ever had the pleasure of using. Totally easy to use, you don't need to have any special make up skills to enjoy this powder it really is as it's name implies a Fairy Godmother for your skin, whatever your age, and the beautiful little gold and ceramic pumpkin that comes on the package it just the cutest thing ever ! This is the part where I really got scared :) 100% pure mineral ingredients with no additives this foundation promised to minimise the look of lines and wrinkles by softening and blurring while adding SPF15 and anti-inflammatory properties to my skin. Applied with a Kabuki brush the powder was the lightest thing I had ever used, you can use as little or as much as you want without it ever looking cakey and corpse bride, it was a joy to use and I am so pleased to have had my opinion changed on the use of mineral foundations, although I cannot promise they are all equal, what I do know is this one works, and it works beautifully. There is a vast range of shades to chose from and to allow you to have the 100% right shade for you the company offer 3 good sized samples for a mere £3.50 which to me shows a huge confidence in the product as well as being totally helpful. Check out The English Mineral Makeup Company here for yourself and see what you think. Don't think anything will dimish deep set wrinkles (laughter lines) and enlarged pores but at least I'll look like a healthy prune! !